Ellen Bornhorst was awarded a Seligman APV Travel Bursary in 2015. 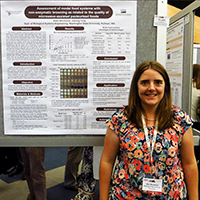 She reports on her participation in the 12th International Congress on Engineering and Food (ICEF12), which took place between 14 – 18 June in Québec, Canada. She tells us how ICEF12 was a great platform for her to strengthen and broaden her professional network and how the event facilitated her long term career goals in academia.